Accessories are the most important feature of any custom build, and a way to separate you and your company from the others. Your choice of accessories, how well you match them up and put them on the car will be part of your success or lack there of… So where are you shopping for your accessories today? Do you get them from 10 different sources? Do you have a plan, or are you shopping on price alone and hoping that you can somehow make them work together? I have come across all of the above, and other more reckless strategies over the years, from my travels to visit numerous golf car dealers. On a recent trip made to Ohio, I saw some really cool stuff. I went to a shop owned by Chad Sweitzer. His place is set back among corn fields in the midlands of Ohio, with an old pickup truck converted into a road sign, he has keeping watch out front. Chad creates works of art; he is a real honest artist and paints a lot of cool designs, mostly the kind of stuff big boys want on the side of their toys. He uses golf car bodies as his canvas of choice and has quite a collection of finished work. He also has lots of pictures of other things he has painted over the years hanging on the walls. From tee-shirts to drag cars, Chad has painted it. In the January/February 2013 edition of Golf Car News, the cover was graced by one of his golf cars painted to look like a mural of complete coolness. Chad has been one of the pioneers of Custom Golf Cars. There are a lot of you pioneers out there, Chris at Ponte Vedra Golf Cars was the first guy I ever saw put automotive/truck 33’s under a golf cart and put its running boards about chin high in the process, but let’s get back to the custom paint and body colors. The concept has exploded as a way to customize your golf car. 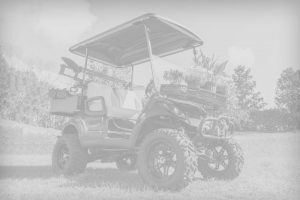 The big OEM’s have even caught on and are offering custom colors, Club Car has a nice offering and EZGO followed them with their own version of Custom Color bodies for sale to dealers. As usual the dealers started something and it has caught on and now aftermarket companies and even the OEM’s have had to pay attention or get left in the dust. As with any trend there is more. Whether it’s wheels, seats, steering wheels, dashes, carpet, tops, enclosures or lift kits, all are being offered in colors. The trend is to put it all together, and get a whole custom package. Now, if your customer comes in and wants a golf cart to look like an orange you can sell them all the stuff to make it happen. We are in the middle of this trend and we will see much more to come. I can’t wait to see when tires are going to be colored to match the rest of the car. Not sure that will make it to market, but something as weird or weirder will. Until then, enjoy the possiblities. TS (September/October16) – What’s in a name? TS (May/June16) – What makes golf car geeks tick!